Suddenly everyone heard a roar. Thick clouds began to rise from the mountain’s top. What seemed to be clouds turned out to be enormous amount of ash, and the biggest volcanic of the century that slowed earth’s warming happened. The ravaging lahar destructed everything on its way, nothing escaped. Lives were forever altered. There was hopelessness. Fast forward more than a decade after, The fields of destruction have found a new purpose and this time it brings joy. The plan was to leave by 3am for tarlac at Mckinley Hill in Makati but there are people like me coming from the north so we decided to split up. The southern guys met up first and picked us up on their way. We had two vans full of travelers! Our only stop over was at a gas station along the North Luzon Expressway for breakfast and buy other necessities. After a satisfying breakfast and chatting for the first time for some of us who just met each other, we decided to go ahead and proceed to our adventure. The travel time was about an hour from Tarlac to the jump off point with one stop for a few minutes for photos. After some picture taking our guide called us up and continued our journey. I would say that the drivers and the guides are awesome, they were able to answer our queries about the trek and the history of the place. I was a bit intimidated when I saw where we will start the trek. We had to cross a make shift bridge to get across, and I was saying silently to my self “okay, were just starting out and we have to cross this already?” thinking that there could be a much more difficult terrain ahead of us. Just like in any adventure there’s always that danger factor, and for this one you would see signs reminding to keep voices low as noise may cause the mountin high walls lahar to erode. We crossed rivers and walked through greats halls with walls made up of lahar. The foot of the volcano from the jump off point is about 6.5 kilometers according to our guides. The guides were actually a bit strict in keeping our group together in one pack, which is quite good to prevent any accidents. What we just didn’t like is that our guide kept on ranting instead of properly advising us. The trail can be easily trekked and you would’t notice much that you’ve walked for more than two hours as you pass by unimaginably amazing scenery. I noticed while walking that the rocks where the stream is flowing at are dark and orange in color. It was because of the high sulfur content of the water, though the rocks are darkly colored the water flowing was crystal clear. I saw Pandelicious ahead of the group. I decided to join her as the trail wasn’t so hard unlike the first one I did at mount Pundaquit. I was really entertained with the small rapids that I see from time to time. I thought that it would be cute if I put a toy boat with some lego people on it and shoot it as it go through the stream making a short movie out of it. After more than two hours of walking we arrived at the foot of the volcano. You have to understand that it took us longer because of how many times we have to stop and take a photo, It was hard not to shoot all the time! We rested for a while to recover from the long walk, It wasn’t that hard since there were just a few uphill parts. The challenge really was maintaining your balance while walking on big rocks. You will see a marker at the start of the uphill climb for Mt. Pinatubo it self. Well I think the statistics on the sign may be true that is if you are alone and there’s no traffic, I mean try walking uphill with 29 friends with you! hahaha I know that was fun! After 30 minutes we reached the the summit of Mt. Pinatubo’s caldera and the view of the lake and the crater’s caldera was simply MAJESTIC! It was lunch time so we ate first before doing any activities, well if staring at the view was a violation I am wrong then. LOL! I just couldn’t help but look at the surroundings! Done with lunch now so we went down to the lake. While I was going down the stairs I was already thinking about going up! It was kinda high so I knew that going back up would be a challenge for me. One thing that we were praying for was the lake’s color. For most of the time the lake has a shade of Cyan but there were instances where some of our friends found the lake’s color was black. So I thank God because the lake looked picture perfect that day. Aside from swimming in the lake you can also take a boat ride to the other side of the crater for 350.00 pesos. It’s a bit pricey for a boat ride but I say that it is all worth the pay. The other side of the crater can be reached by foot as well via the Delta 5 trail. Named after an elite group of military people the Delta 5 trail isn’t easy at all. The other side was beautiful! It was as if I went to another place as my perspective changed. What amazed me most was the steam rising from the soil. I tried capturing it on a photo but it wasn’t thick enough so I took a video of it. Of course as not be missed would be our obligatory window shot. Thanks to Brenna and Pandelicious for this photo. We only realized that it was time to leave when the boatmen came back to fetch us. We had so much fun at that side of the lake with endless picture takings. On our way back we included the boatmen in having fun and had them get into a race to the lake shore and they were really at it putting effort in winning the race! It was time to leave the lake and bid goodbye to the mountain. It was really fun being with the “Bagets”, I’m not that young so being with this 20 year old guys really made me a bit younger. Anyways, forward we go as we descend from the caldera. The trail looked different for me as we go back. We also noticed that the water flowing on the stream was a lot weaker now. Thanks to our guides who always made sure that we are safe, I enjoyed my walk back to the jump off point the most. I intentionally walked slower and went off last. It was nice to walk back and listen to music while marveling again at the majestic scenery. In less than two hours we were back at where we left the 4×4 trucks. Every one was tired but I guess what kept me up on our way back was still the amazing view. But then again nature was not yet done in showing off its beauty. As I turn my head back I saw the clouds as red as if it was burning. 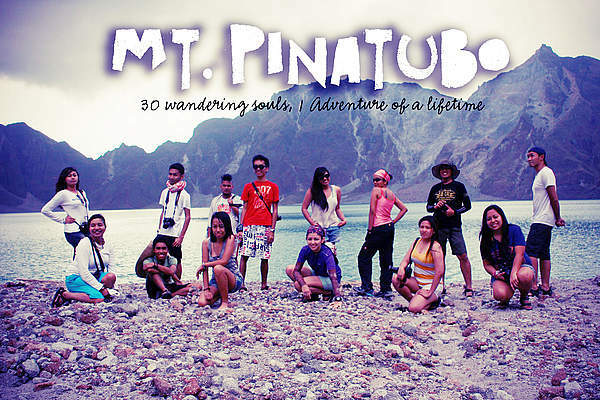 I say Mount Pinatubo didn’t meet my expectations, it exceeded it. Till we meet again glorious mountain!